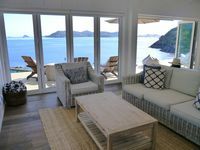 Properties in Whangaroa average 4.7 out of 5 stars. One Bedroom Unit with bathroom and small living area with kitchenette. Property 7: One Bedroom Unit with bathroom and small living area with kitchenette. Property 14: Self Contained Chalet with private spa...perfect!! White sands, swim, surf and fishing beach. Property 28: White sands, swim, surf and fishing beach. Comfortable beachfront house at Taupo Bay. Property 38: Comfortable beachfront house at Taupo Bay. Amazing lodge over looking Taupo Bay, stunning! Property 39: Amazing lodge over looking Taupo Bay, stunning! The Beach Bach - Basic kiwi bach perfect for a relaxing holiday. 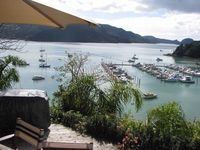 Property 41: The Beach Bach - Basic kiwi bach perfect for a relaxing holiday. Amazing property with stunning views! Newly built with garden and landscaping still a work in progress, but the landlord did let us know in advance. Views are priceless from the deck and the modern house topped it off. Would love to come back again if possible!